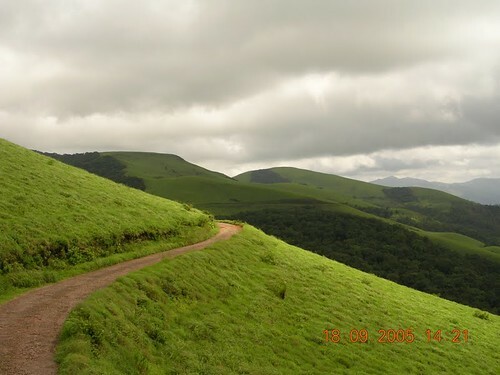 Misty mountains, birds chirping, cool breeze, mountains & paths filled with lush green grass, small streams with crystal clear water..., all these are some of the amazing beauty of Malenadu (a region in Western Ghats). 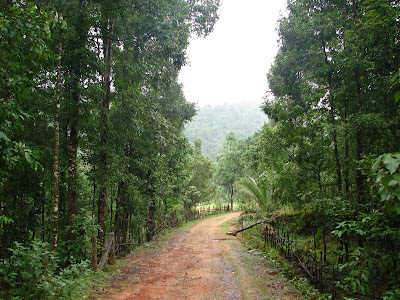 Monsoon creates magic here & this place becomes a paradise on earth. I have loads of memories attached with these places. Though I have spent my childhood days in cities, I never missed to come here during holidays. I used to envy my cousins who spent all the time there. Even now, the very thought of visiting these places makes me rejuvenated. During my visit to India this time, I did visit some of these places but could not spend much time. Whenever I visit my aunt's place in Malenadu, she serves me home made akki shavige/shamige (rice vermicelli). She prepares the tangy lemon shavige as she knows that it is a hot favorite for many of us. 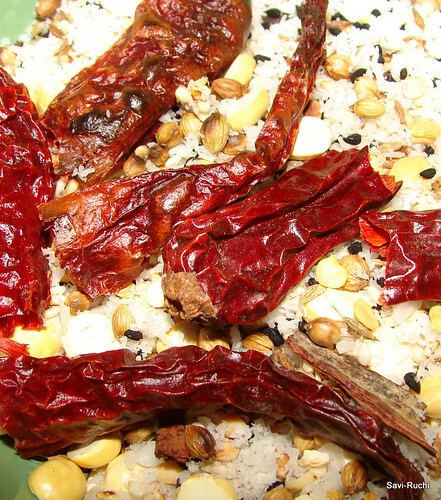 Here in Singapore, I do not have the instrument to prepare akki shavige. Hence, I have used store bought rice noodles/vermicelli. 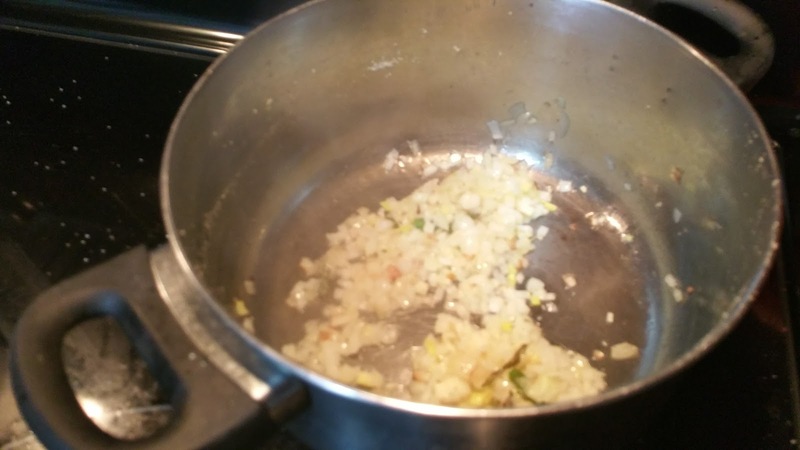 Boil water in a broad pan. Add salt. When water starts boiling, add the rice noodles & cook according to the package instructions. (I normally cook for 3-4 mins). When noodles become soft, turn off the heat & let the noodles sit in hot water for another minute. Drain the hot water & run the noodles under cold water. Break the noodles into manageable size. Meantime, prepare the tempering. Heat oil in a pan. When oil is hot, add mustard seeds. When mustard seeds splutter, add urad & channa dal. When dal turns golden, add ground nuts & roast till the nuts turn golden brown. Add green chilli, curry leaves, turmeric & turn off the heat. Pour this tempering over the noodles, adjust salt. Add lemon juice, coconut, coriander leaves to the noodles. Mix then thoroughly. Serve it with chutney, pickle or as is. How are you guys? What are you planning for Christmas & New Year? I am back this monday & am all tired, sad, sick & what not!! On top of it.., I had to rush back to work on the same day.., hmmmmm..., Boring isn't it? I will write about my exciting trip to India in my coming posts. Also, will soon catch up with you guys too. I have got few recipe requests. Will try to publish them in the coming months. I will quickly jump to the recipe & stop all the blah.., blah..
For the batter: Add the gram flour, rice flour, chilli powder, salt, baking soda to a bowl & gently mix them. Heat the 1 tbsp oil & when the oil is hot, add it to the gram flour mixture. Mix it again. Now add water (little at a time) & prepare the batter. Batter should be like a thick milkshake. Wash each doddapatre yele(leaves) carefully & allow it to dry or pat them dry. Add sufficient oil to a deep pan & heat the oil. 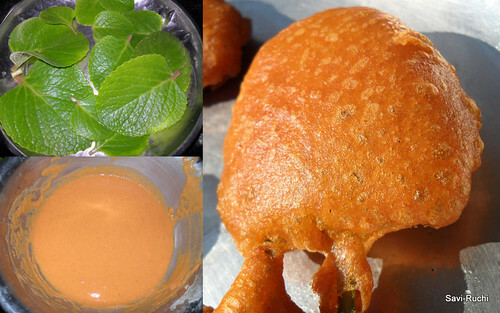 Dip the leaves in the batter(one leaf at a time) & put the leaves properly coated with batter to hot oil. Fry on both sides until they turn golden brown. 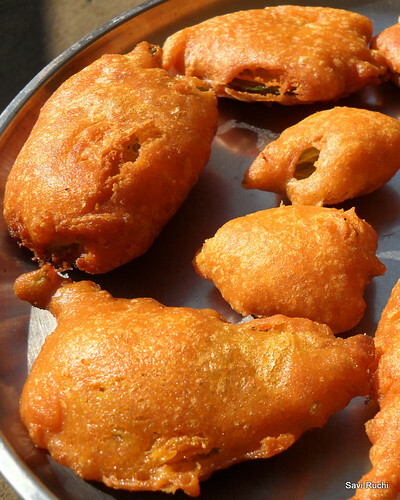 Drain it on an absorbent paper & enjoy the hot bajji/pakora with coffee/tea. 1. 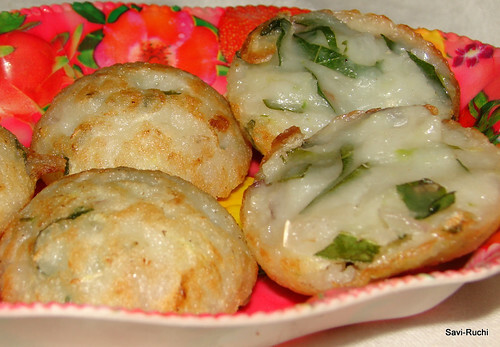 Donot try to mix ginger, garlic, coriander leaves to the batter as it would out power the aroma of doddapatre leaves. 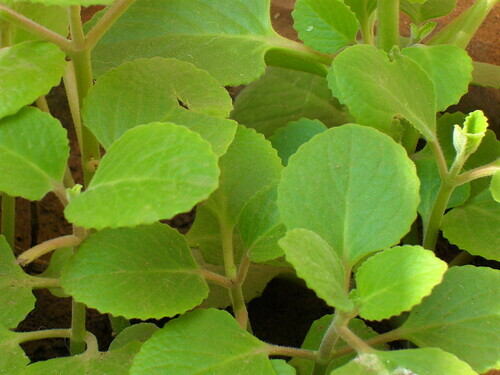 These leaves have a great aroma (difficult to take.., if you are first time to this leafy vegetable). 2. Be very gentle while washing these leaves as they tear our easily. 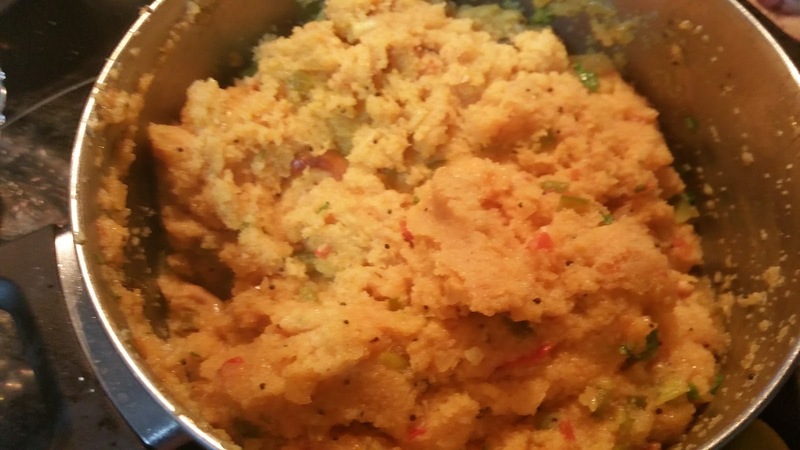 Will write more about the medicinal values of doddapatre in my coming posts (One more interesting recipe using doddapatre soppu is following soon). Meantime, have a close look of the leaves. "Merry Christmas. Enjoy your day with family & friends"
This was in my draft since Krishna Janmastami & I was hoping that I atleast publish this for Deepavali. But.., again I'm late..
Anyways, better late than never. Happy Karthika Masa/Masam/Month. Diyas are lit infront of our house for this whole month & each day of the week is celebrated. So, what did you guys cook at home?Did any of you buy gold/platinum/silver on the dhanteras? At my side.., nothing. No gold/silver too. We were on a short trip to Indonesia & so not much of celebrations. We were back only after Deepavali. I'm happy that I spent all the time with my kiddo & hubby, which otherwise I would have spent in the kitchen. Gently, mix together the condensed milk & milk powder. Ensure that there are no lumps. Add in the butter & mix again. Pour the batter to a microwave safe bowl. Heat/cook in the microwave for 3 minutes (check the temperature settings). Remove the bowl, stir well & put in the microwave again for 1 minute. Repeat the steps 4 & 5, for 2 more times. Ensure that the rawness of the milk powder is removed & it is cooked well. Allow it to cool for another 5-10minutes. 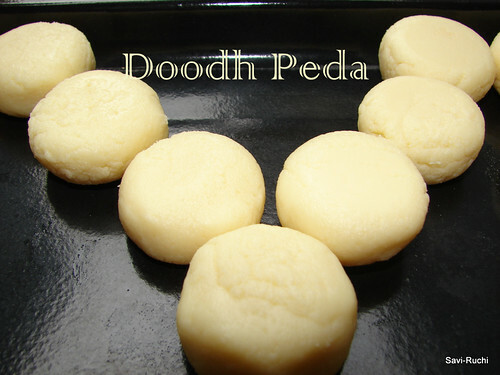 When the batter is still warm, prepare small lemon sized balls & give it a nice peda shape. Cool it in the refrigirator for 1-2hours before serving. Update: Hurray! 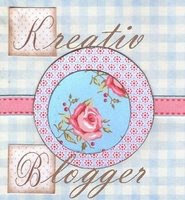 !, I won a tote bag from Foodie Blogroll. I am eagerly waiting to receive it. 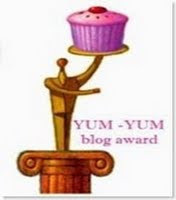 Thanks a lot Foodie Blogroll. Hurray!! !, we have booked our tickets to India. I am all excited & have no mood in doing anything (of course I'm dreaming & planning about my trip to India). I'm in no mood to cook too. To add to my laziness.., my hubby is on diet. He is on some #$%^@ diet for one month. So, whom should I experiment on?!! I don't want to risk on myself ;) Hence, my kitchen is closed for experiments this month. 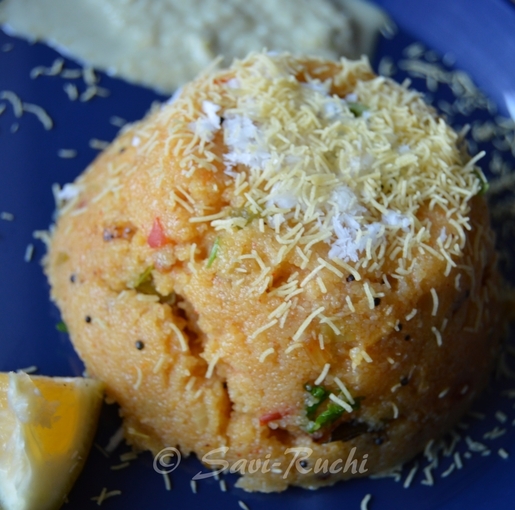 So, today I'm giving you a tried & tested dish that I have been cooking for many years now. 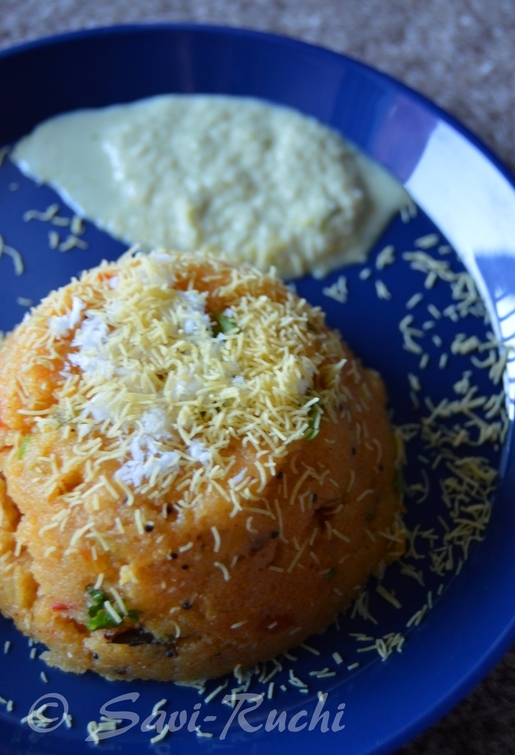 A very simple & delicious 'Karnataka style' palya recipe for you all to enjoy. Here are the ingredients & the method. Wash the ivy gourd & pat dry. Chop them into thin slices or discs. Heat oil in a broad pan. When oil is hot, add mustard seeds, curry leaves & saute until mustard seeds start spluttering. 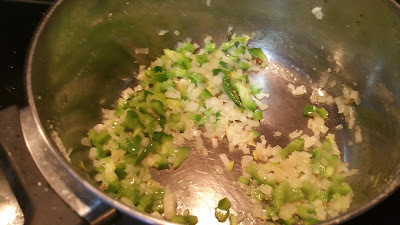 Add the chopped ivy gourd & saute them well. Add 1/2 cup water & allow it to cook on a medium flame. Meantime, make a coarse paste of coconut, mustard seeds & chilli powder. Add a tbsp or 2 of water if required. 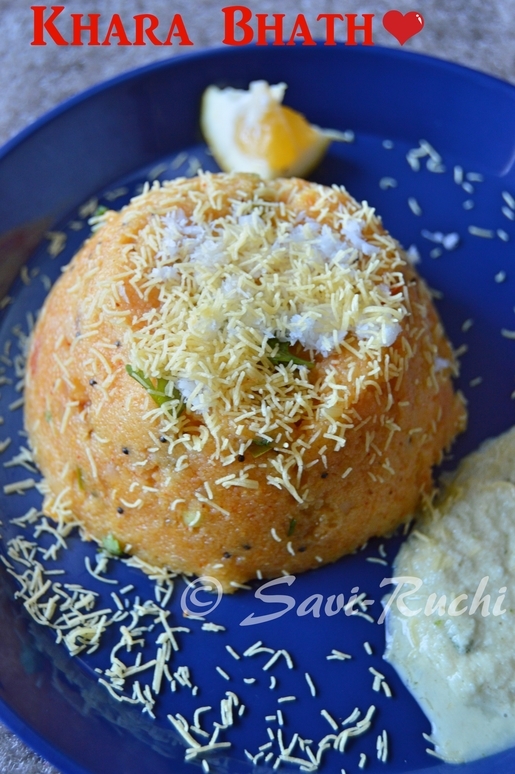 When the vegetable is cooked & soft, add the salt, huli pudi(amchur powder) & the coconut masala. Cook for another 2-3minutes. 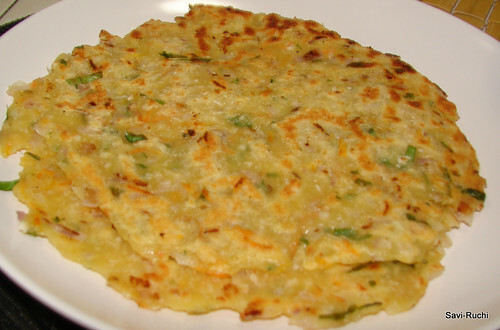 Garnish it with coriander leaves & serve it with rice or roti. The palya has to be dry & not a gravy kind of stuff.Hence, keep a watch on the amount of water added to the masala & to the vegetable. 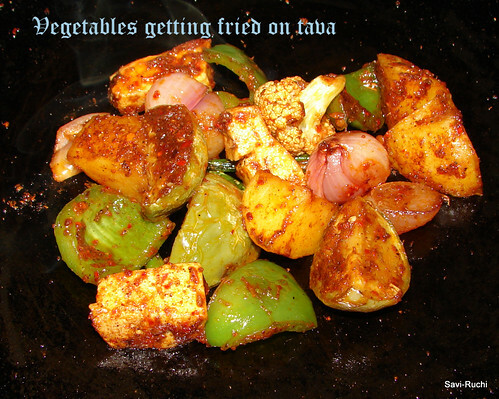 For faster cooking, pressure cook the vegetable before hand & then prepare the palya as mentioned above. Some of my friends have commented that I have reduced the number of posts/month. Sorry pals, I was busy with other activities. I hope to publish atleast once a week. 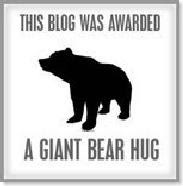 Also, thanks for being regular to my blog. Soak the rice in water for about 4-5hours. Drain the water & prepare a smooth paste out of it. Donot add much water as the grated cucumber oozes out water. 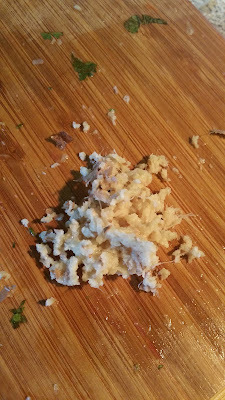 Squeeze out the water from the grated cucumber. Heat the appe/guliyappa pan. Add few drops of oil to each mould. Add 2 tbsp of the batter to each mould & cook it on a low heat for 2-3minutes. Turn the guliyappa & cook on the other side too. Serve it straight from the pan drizzled with some home made ghee. Rub the ends of the cucumber well. Also, it is better to taste the cucumber before adding it to the batter. Some cucumbers will be bitter. If the cucumber is bitter, then discard them & use another cucumber. 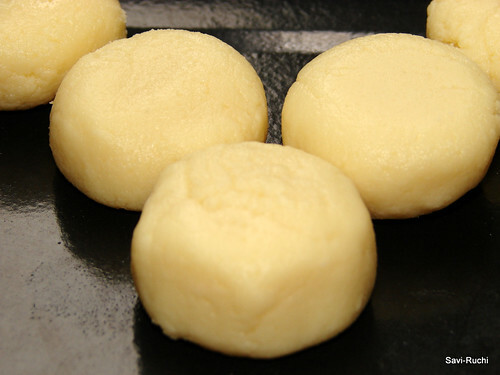 Ensure the batter is of normal idli batter consistency. 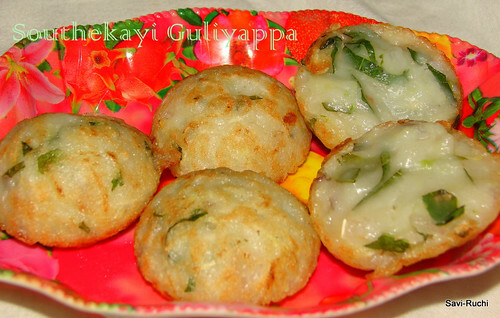 Eat these appe/guliyappa hot or atleast warm. 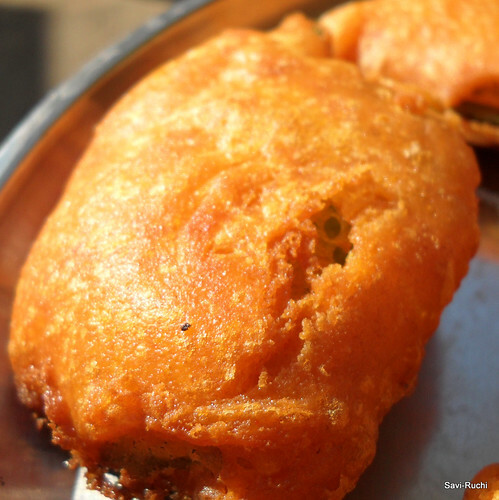 If this guliyappa is consumed after it reaches room temperature, it becomes chewy. Use tender cucumber for better results. Needless to mention, during my parents & in-laws stay, they prepared soo many simple & quick rasams that my maid requested them to teach it to me & her. There used to be a fight to decide who shall cook for the day. My mom-in-law would unanimously win most of the times :D. During their stay.., nimbe saaru is one of the many recipes learnt from my MIL. If you keep this rasam thick.., it is named thovve (dal). Water : Around 1 litre. Pressure cook the moong dal & allow it to cool (2-3 whistles or 15minutes must be sufficient for the dal to be soft). 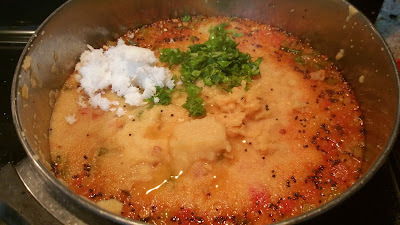 Mash the dal gently & add the mashed dal, water to a broad pan. Add turmeric, half of the chopped green chillies, pepper powder, salt & cook on a low heat until water starts to boil. Once dal starts boiling, turn off the heat. Prepare the tadka/tempering/oggarane. Heat oil in a small sauce pan. When oil is hot, add mustard & cumin seeds. 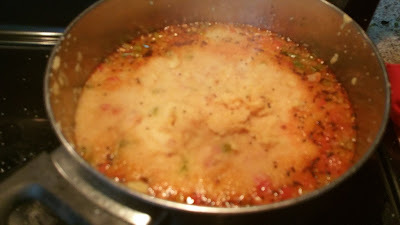 When mustard seeds crackle, add the remaining green chillies, curry leaves, asafetida & pour the tempering to the rasam. Add the lemon juice, coriander leaves & mix well. 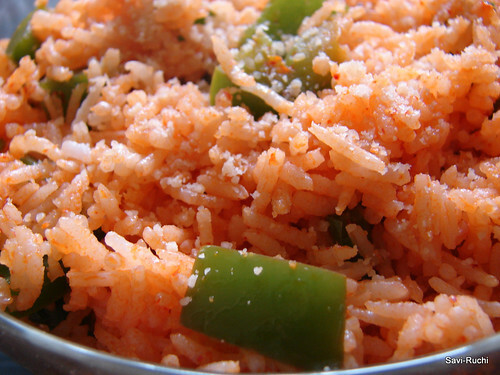 Serve the hot rasam with piping hot rice, pickle & papad. Reduce the amount of oil & drink it as a soup too. This rasam is helpful to beat the cold as it is rich in Vitamin C.
Add a pinch of pepper powder to take double advantage for fighting against cold. Do you remember my project "shifting the house"? I had mentioned about black eyed peas starring at me in my cupboard. During that time, I was eagarly searching for black eyed peas recipes as I had almost a kilo of dried peas. During the active search, I found a recipe here. 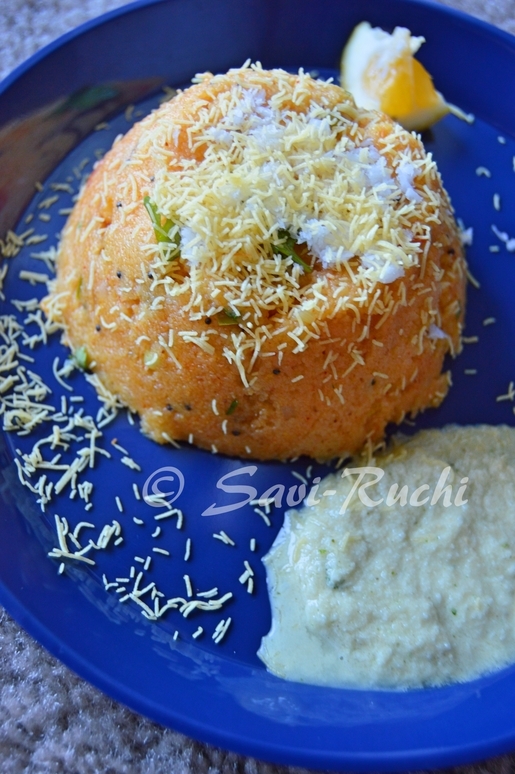 I adapted the recipe to make it suitable for Indian taste buds. Voila! !, it tasted awesome. One of the best pastas I prepared & relished until now. My hubby happened to carry that pasta to office & I got a huge fan following for black eyed peas 'N' pasta. Secret, secret..., we both (who else other than me & my hubby) have stranger anxiety. We don't want to try anything other than penne(because of their funny shapes). So, all my pasta recipes use penne only. I am planning to try macaroni soon. I am not sure whether it will be accepted or not. Soak the black eyed peas for 5-6 hours. Add little salt & pressure cook or boil the black eyed beans until soft & yet firm (It would take around 3 whistles in the cooker). Allow it to cool & drain the water from the peas. Cook the pasta as per the package instructions. 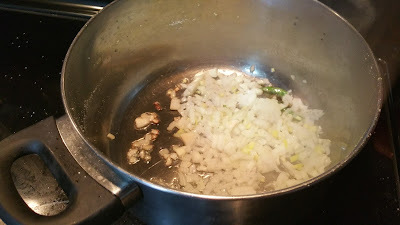 ( I add 3-4 litres of water(for 500gms penne), salt & few drops of olive oil & allow the water to boil.When water starts boiling, add penne & cook on medium-high heat for 10-15minutes, until soft & firm. Refer to the tip here to find out when pasta is properly cooked). Drain the water from penne & add few drops of olive oil. 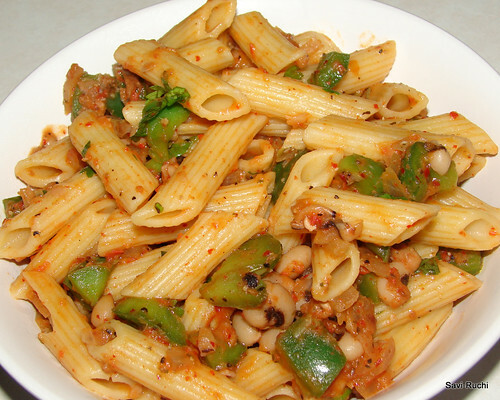 Olive oil helps in keeping the penne seperate & the pasta doesnot stick to each other. Heat olive oil, butter in a broad pan/wok. When oil is hot, add garlic, onion & saute till they turn golden brown. 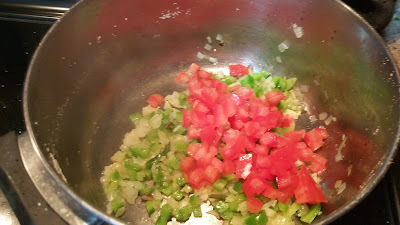 Add tomato puree, pasta herbs, sugar, paprika, salt(be very careful when adding salt as we have already salt while cooking penne & black eyed peas).& cook on a medium flame. The raw smell of tomato should disappear & the sauce must become thick. During midway, add capsicum & keep heating the sauce. 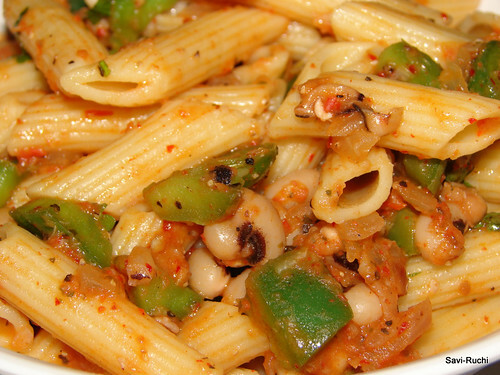 When capsicum is half cooked, add cooked black eyed peas, cheese & reduce the heat. Cook for another minute or two. Add pepper powder. 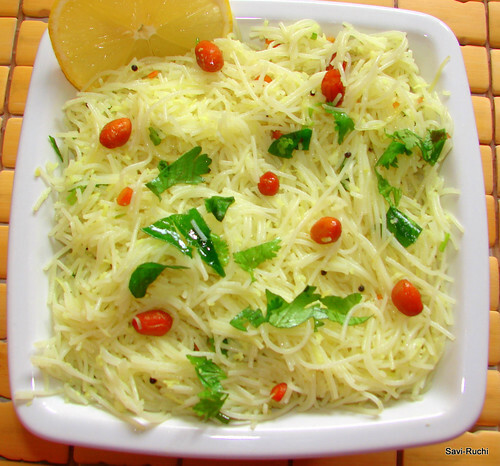 Toss the pasta with the sauce, garnish with coriander leaves & dig in. Last but not the least, I have got quite a few awards from my friends. Sorry..I missed announcing them in last couple of posts. Thanks a lot Jyothi & Sushma. I have put the awards on the sidebar. I will talk about "The honest things" in my next post. Keep waiting !! 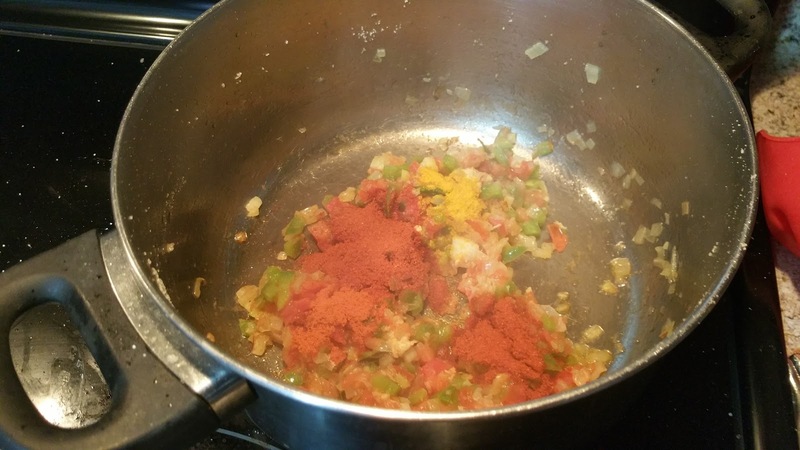 Update: This recipe goes to MLLA hosted by Sia & started by Susan. 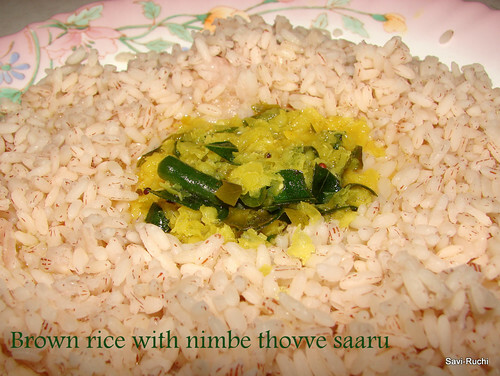 Though I have spent a part of my childhood days in North Karnataka, I didnot have the recipe of this. I got this recipe from my friend who has literally grown up eating them. Thanks a lot for the recipe. Dry roast all the ingredients mentioned (except coconut, roasted channa dal, asafetida & salt). Allow the spices to cool. After dry roasting the peanuts, peel the skin & keep them aside. 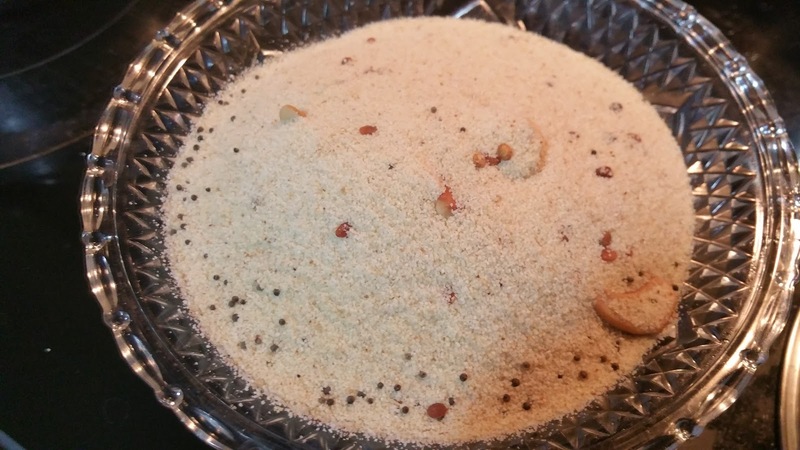 Mix roasted channa dal, coconut, asafetida, salt to the other spices & prepare a fine powder. Finally add peanuts & run the mixie for 5secs (idea is to powder the peanuts to a coarse powder). Wash the eggplant & pat dry. 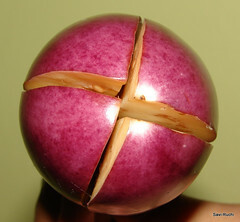 Make a slit of the eggplant as shown below. Fill a tbsp or less of the spice powder to each of the eggplant. Keep the stuffed eggplant aside.Heat oil in a broad pan (ensure to take a very broad one, as it has to fit all the eggplants). Add mustard seeds, cumin seeds. When they splutter, add curry leaves, garlic & onion. Saute until onion turns golden brown. Add tamarind extract, remaining spice powder, stuffed eggplants & stir well. Oil should coat on the eggplants. 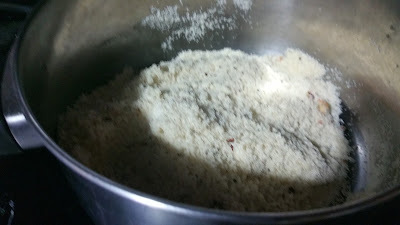 Add water, salt (check the taste & then add, because we have already added salt to the spice powder), jaggery & mix well. 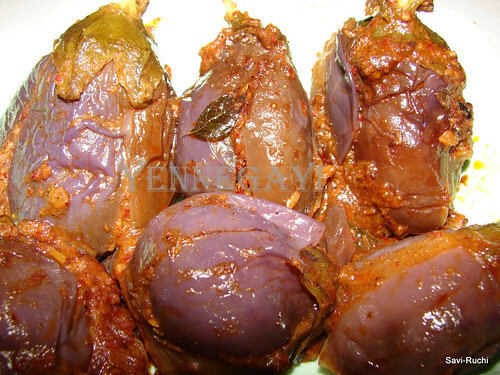 Cook the eggplants on a low heat sitrring occasionally. Add few tbsps of water if required. Cook until the gravy becomes thick & eggplants soft. (It takes around 10-15 minutes). 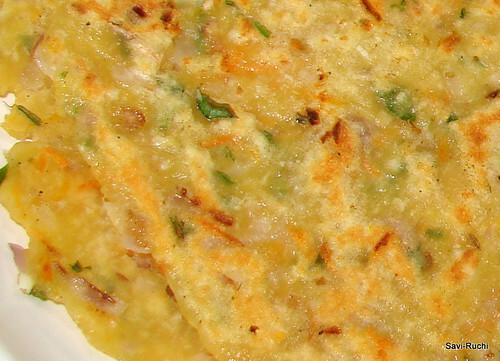 Turn off the heat, garnish with coriander leaves & serve it with hot rotis. 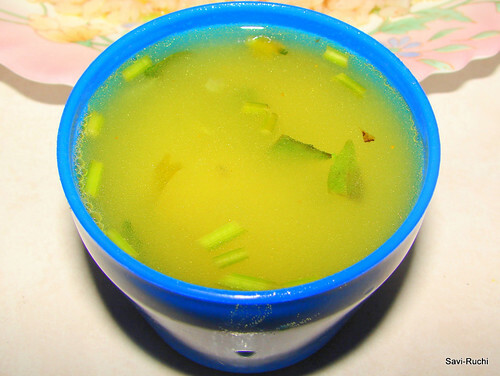 Yennegayi literally means kayi(vegetable) cooked in yenne(oil). The more oil you put, the tastier the dish would be. The dish would tast equally good without garlic & onion too. My mom doesn't add them & I love that version too. Try to take equal sized eggplants as all of them get cooked evenly. Nigella seeds are a must to get an authentic taste to the dish. I was clean bowled by her pictures & step-by-step procedure. I went to NTUC & bought all the things required to prepare the burger. Thanks a lot Nags for inspiring me to prepare veg burger. I modified her patty recipe to suit our taste. Also, I used iceberg lettuce instead of the baby greens. Rest of the procedure remains same. Mash the potatoes ensuring no lumps are left. Add all the ingredients mentioned (except bread). Soak the bread in water for 5 secs. Squeeze out the water from the bread. Mash the bread & then add it to the mixture. Mix them thoroughly. Prepare 8 equal sized balls (around the size of a ping pong ball). Pat them gently. Heat the oil on a griddle/tawa. When oil is hot, place the patties & shallow fry them on a medium/slow heat for 5 minutes on each side. Remove the patties from the griddle. Cut the burger bun (There would be an indication in the burger bun itself. Use this to slice the burger bun). 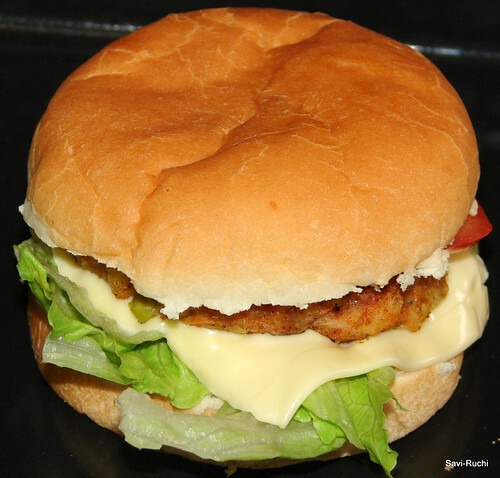 Tear the lettuce leaf & place them on the lower portion of the burger bun. Place the cheese slice above the lettuce. Now, place the hot patty over the cheese. Smear some sauce/spread over the patty. Place the slices of onion & tomato over the patty. Finally close the other slice of bun over the slices of tomato & onion & enjoy!! Place a relatively hot patty over the cheese slice as it helps to melt the cheese a little. This adds an extra zing to the burger. Donot skip the usage of iceberg lettuce. The crunchiness of iceberg lettuce takes the burger to another level. 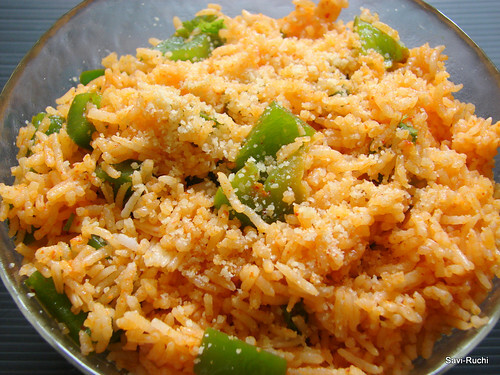 People who are calorie conscious are requested to be away from this dish. Dont even see the pictures. Though the pictures have not come out good, there would be chances that you might feel like looking at the ingredient list. By chance if you happen to see the photo, dont ever peek into the ingredients because you might feel it is very simple & might think of giving it a try. Also, if you happen to try, dont blame me that I spoilt your diet. Sprinkle some salt on all the chopped vegetables & keep them aside for 5-10mins. 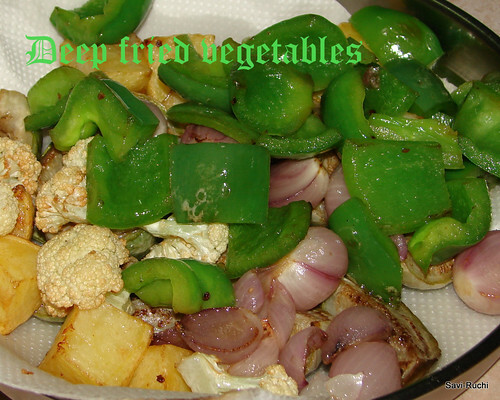 Squeeze the water released & deep fry the vegetables till brown. Vegetables should get half cooked in oil. Drain in an absorbent paper. Add a tbsp of oil. When oil is hot, add a big pinch of green chilli paste, add the few pieces of fried vegetables of your choice. 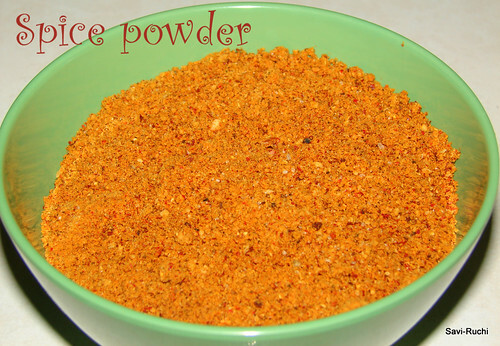 Add a pinch of red chilli powder, pav bhaji masala, chat masala, amchur powder, salt & 1-1.5tbsp of tomato puree. Mix them well. Allow it to cook on a slow flame for 3-5minutes. Keep stirring in between. Remove it from the tava & serve it immediately with roti/phulka. Prepare the veg for 1 person at a time. Dont load all the vegetables as it becomes difficult for the spices to blend well. 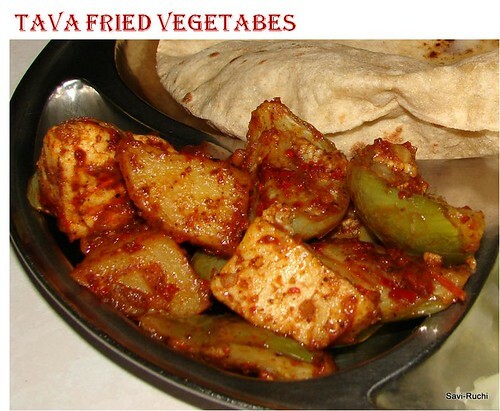 Feel free to use other vegetables like okra/ladies finger & mushroom to this dish. I didnot have okra handy, else I never miss adding them. Okra & mushroom blend very well with the above spices. 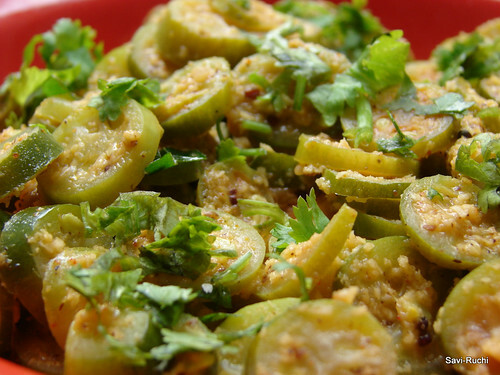 I happened to change the photo of bhindi besan. Have a look here.